When I got the Avaaz newsletter about this incredible accomplished my first thought was: And how long will it take to do that here in North America? About three-quarters of global food crops rely on bees and other insects to fertilise their flowers, so the decline of honeybee colonies due to disease, habitat loss and pesticide harm has prompted serious concern.. Indeed. Sadly and quite surprisingly to me Germany opted out as did the UK. Germany has been a great supporter of Bio (organic foods) and every times I go to Berlin I am always amazed at how many Organic only grocery stores there are and how big the Bio sections are in regular stores, so I’m not sure …oh that’s right Neonicotinoid Pesticides are made by Bayer CropScience – and their corporate offices are (drum roll please) in Monheim GERMANY… no conflict of interest there now is there? My guess is it will take a decade before any such legislation like this will happen here – and not wanting to be Debbie downer or anything, but by that time they will have made billions in profit and most of the bees will all most likely already be dead. Who needs food anyway? Or maybe by then Monsanto will have created a genetically modified robotic bee that they will lease to farmers to pollinate there crops? 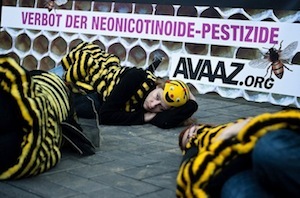 This entry was posted in Other Stuff, Politics and tagged Avaaz, Bayer cropscience, bees, colony collapse, Germany, Monsanto, Neonicotinoid Pesticides, pesticides, The Guardian Paper, UK. Bookmark the permalink.